I recently purchased a 98 XJ8. Thought it had a cylinder wash issue from the way it sound when it turned over, it wasn't. Now i'm sure it's a timing issue. My question is how do i know when the timing is properly set. I attached a video of the secondary chain tensioner that i believe caused the no crank issue. Any suggestions? 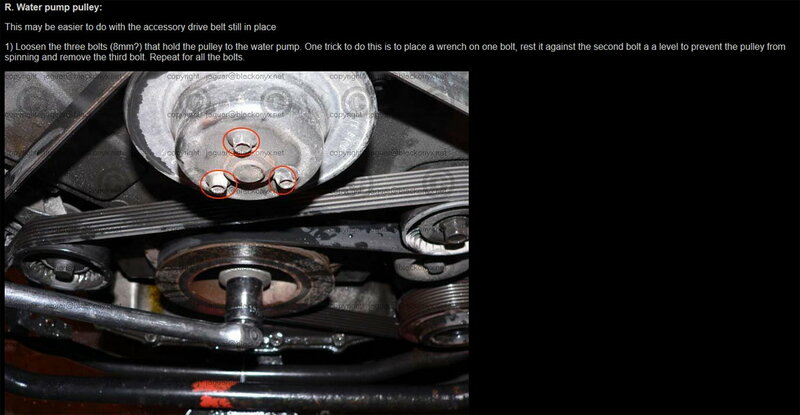 Capital, this is an excellent timing chain tensioner walk-through by "blackonyx". If you scroll about half way down to pages "V" and "W" he covers the method for checking the timing. As for whether to do just the upper tensioners, or both uppers and lowers and chains, you will find the opinions here will overwhelmingly be to do both. Thanks for the info. I think I'm going to replace the chains and tensioners. Started working this today. The only issue I have right now is removing the pulley from the water pump. I have removed two screws but the last screw is proving to be a little difficult. There is no way that i see to keep it from rotating while I attempt to remove the screw. Anyone have any recommendations. Did you leave the belt in place? That's usually sufficient. I did not but will re-install the tensioner pulley and belt then try to take the last screw off. thanks for the suggestion. Or, if all fails, a strap holding wrench as M.Stojanovic suggests is another option. Usually those bolts are not that tight, once you get a holding method they break loose pretty easily. 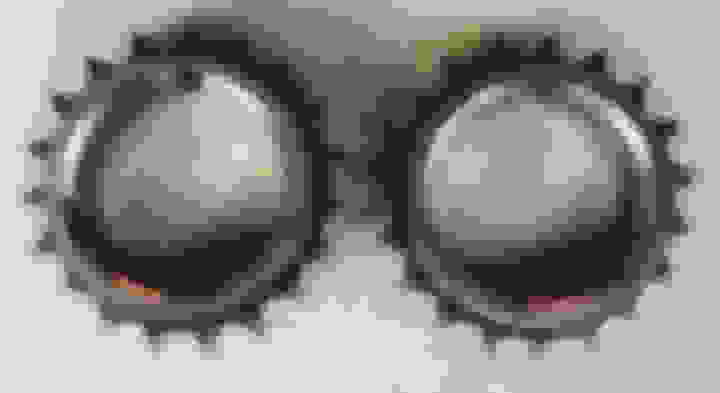 Last edited by Carnival Kid; 03-09-2019 at 08:10 PM. Got the last bolt off by replacing the serpentine belt back on. Now to remove the crankshaft pulley bolt. Planning to use a cordless impact wrench for this task. This plug replaces the crankshaft position sensor on the front of the flywheel housing. It keeps the crankshaft from rotation. 1) Remove the access cover for torque converter bolts from the housing. 4) Rotate the crankshaft (with the pulley securing bolt) until a triangular arrow on the driver plate is seen through the access hole. You will also notice that the flat surface on the camshafts is now at (or near) the top of the engine. Wouldn't it make sense to rotate the crankshaft with the pulley securing bolt before taking it off the crankshaft. I plan to use a impact tool to release the bolt from the pulley. V. Crankshaft setting plug E36408: Wouldn't it make sense to rotate the crankshaft with the pulley securing bolt before taking it off the crankshaft. I plan to use a impact tool to release the bolt from the pulley. You have to remove or, at least, loosen the crankshaft pulley bolt before inserting the crankshaft setting plug, using the crank pulley holding tool. Even if you manage to undo the crank bolt using an impact gun (when you may not need the pulley holding tool), you will still need this tool to later tighten it. The force (or impact) required to undo the crank bolt is extremely high and the setting plug, as well as the flex plate, are not designed to hold such a force and will be damaged. The plug is designed to only hold the crank in position for the alignment of the cam flats. Even when tightening the cam bolts, the crank plug is not countering the force but the cams are held by the tool over their flats. As for the insertion of the crank plug, I found an easy way - position the crank somewhere just before the cam flats come to aligned position; install the crank plug using a longer bolt than the one holding the crank sensor so that you can insert a suitable spring over the bolt to apply some pressure onto the crank plug when installed but has not yet "found" the hole in the flex plate; very slowly rotate the crank further until you hear a "click" of the crank plug when it pops in; replace the long bolt and spring with the bolt from the crank sensor and tighten. I didn't keep the sprockets in the same orientation in section Z. So how can I make sure that the sprockets are 1/2 of a tooth out of phase? I'm doing this but really don't understand this. I think the picture that accompanies section Z shows the teeth 1/2 out of faze, i.e. the peak of one sprocket tooth lies in the valley of the associated sprocket tooth.......................although to be truthful, I don't think you can get them out of faze, because the chain will only fit on the teeth one way, and each of the gears are not keyed to their shafts, so there is infinite "alignment". But of equal or greater importance is the alignment of the crankshaft gears/sprockets on the primary (lower) chains. The crankshaft gears/sprockets also have to be a 1/2 tooth apart. The gears are located with a woodruff key so they are easy to align, but they can go on backwards. To ensure proper fitment the front gear/sprocket has a centerpunch mark which should face towards the front (towards the person fitting the gears, i.e. 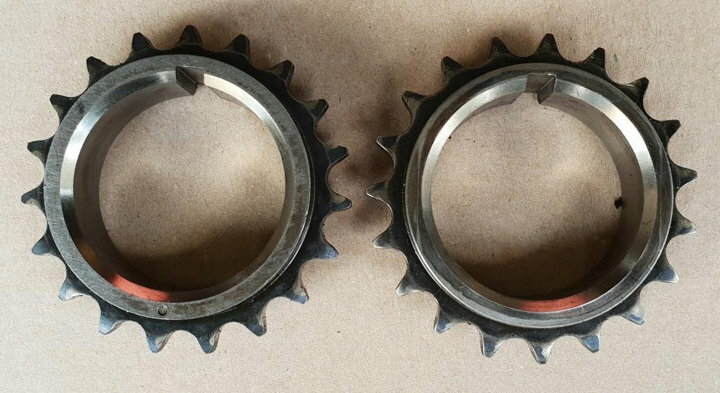 visible when the gears are fitted) and with both gears/sprockets fitted correctly, with the centerpunch mark to the front, the teeth on the gears/sprocket teeth should be 1/2 tooth out of faze with each other. 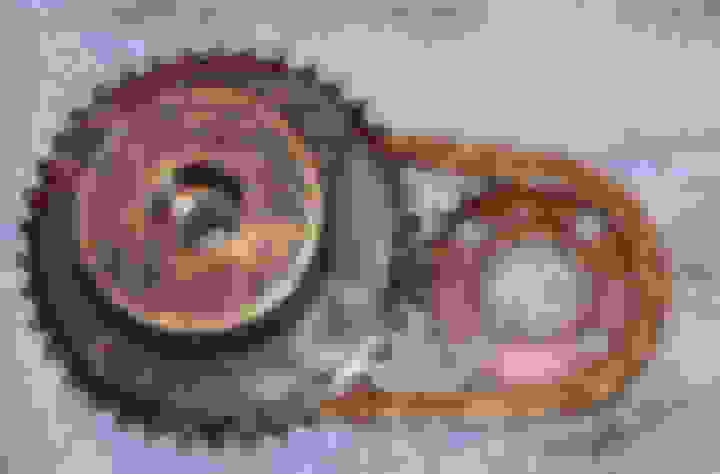 This is easy to see visually because the teeth of the two seperate gears/sprockets are directly next to and in front of each other. If I remember correctly only the front sprocket has the centerpunch mark, and as long as this mark is to the front, and the teeth of the two sprockets are 1/2 a tooth out of faze everything is correct, if not then the back sprocket needs to be removed and replaced the other way round. so that both sprockets' teeth are out of faze. 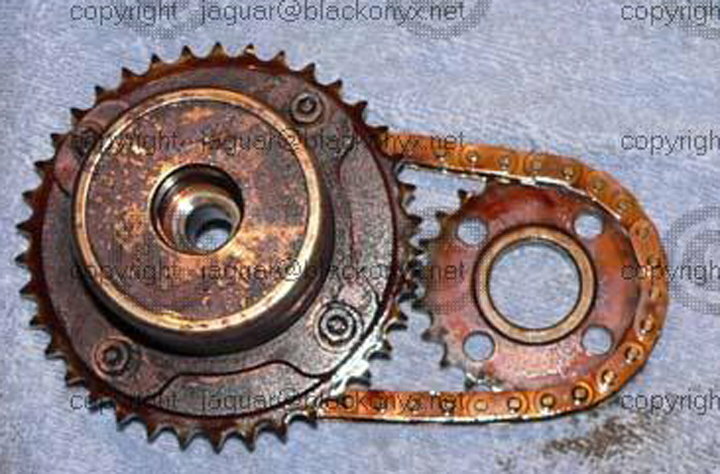 XJ-40 Timing Chain? or Timing Belt? Doing the Timing STR... Timing Tool removal?? Timing belt or timing chain on these cars? How many miles?